I don't collect modulars. I don't build modulars. I hear about them a lot though. When I do hear about them, one set seems to be spoken about more than any others. The Green Grocer pops into conversations about modulars seemingly more often than any other. Whether it's the difficulty in getting the Sand Green pieces or how good it looks, or how expensive it is, it's a popular topic of conversation. Wait, you might say. If I have no experience with this set, why should anyone want my opinions about it? Well, that's a fair question. I'm not really going to be presenting my opinions about the set, about its looks or the difficulty level of building it. Instead, I am providing analysis of the parts. I get curious when I read about an expensive set and want to know what makes it something unique. Many people have totes and bins of parts laying around. Most of them wonder why they couldn't just build the expensive sets with what they have on hand. When the Green Grocer was released in 2008, it carried a retail price of $149.99. This is actually a fairly reasonable price considering the high piece count and size of the set. I would expect closer to $249.99 based upon my experience with Star Wars and Super Hero licensed sets. However, Modulars seem to fall into this price range though, so not really a surprise. What may be a surprise to some is the current cost to acquire this set. A used copy can be found in the $600-$700 range. Depending upon your patience or your need for the box or instructions, you may pay more. Looking at completed auctions on Ebay, some people have paid as much as $850 for a used set. If you insist on new, you're going to be spending more than $1000. Usually the prices are closer to $1200-$1300 for a new copy on Ebay. The Brickpicker price guide shows a similar range as does Bricklink. 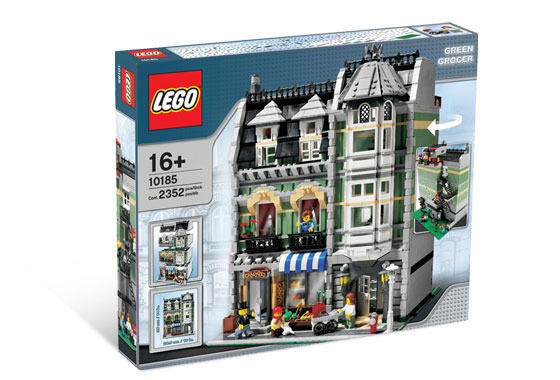 The Green Grocer is a large set, the piece count, as listed on the box is 2352 (2335 if you go by the piece count on Bricklink which incorporates the minifigures.) Many LEGO buyers have more extra pieces than that laying around, but it is not an insignificant number. I would think that your kids would notice if you took that many pieces from their collection. Random pieces are not going to build this set, however. There are around 300 different elements (depending on whether you include the minifigures in your count or not.) An element in this situation refers to the unique part/color combination of the parts. I am not going to analyze every single part for this article. Instead I will focus upon 2 types of parts. The first type of part that I will analyze are the parts that are most numerous in the set. I've found that while I may have some of the parts for a large set, I rarely have the quantity needed of certain pieces. The first segment will include every element that you need 25 or more of. The second segment are the more specialized pieces. There are pieces that are expensive and there are pieces that are rare. Usually there is a correlation between the two. I will be listing all of the parts that cost more than $1.50 each and/or appear in 10 or less sets. Some pieces may qualify as both most numerous and rare, I will only list them once, making sure to note that they are to prevent bloating. If I take an average sold price for all of the pieces including minifigures, but excluding box and instructions, I get $713. This is our base cost and only goes up when we think about the multiple orders needed to complete the set and the shipping charges that will be added on. Unless you already have a half completed set or know where to find most of the parts cheap, you're better off just buying a complete set. If you like the challenge though, don't let me dissuade you. So, of our parts that appear 25 or more times, we have 25. Many of them are common pieces that won't cost much individually, but may be a significant cost when you factor in how many you need. Some parts though are expensive and numerous. Most images below will represent the part/color combination that is being talked about. In some cases I couldn't find a good image that matches the exact combination, so the image will represent the part but not the color. The first part in the list actually belongs in both categories. Kind of a bad start if you are thinking of building this on your own. You need 56 sand green Brick, Modified 1 x 2 with Groove. 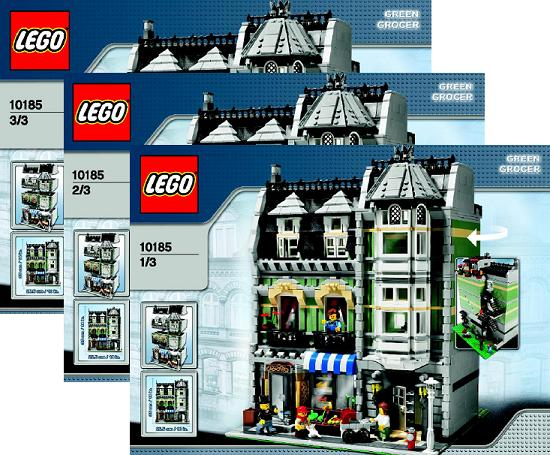 Element 4216 appears in 2 sets, this one and 10217 Diagon Alley. This set requires more than twice as many of this piece. It averages $3 each, but to get the quantity you need, you'll be about $3.50 each. You're looking at $170-$200 just for this before shipping. Back to common pieces, you need 51 element 3023. Light bluish grey 1x2 plates occur in 600 sets and may be found in the quantity you need for $.03 each. Did I hear someone say that they wanted more rare parts that you need a lot of? Well I thought I did. Coming in at an average of $3.50, you need 50 element 3008. Sand green 1x8 bricks appear in 5 sets. The Statue of Liberty only needs 25 of them and UCS Yoda only needs 2. It's quite a roller coaster here. Element 3062b occurs in 232 sets and averages $.05. Although, you can get the 46 Light Bluish Gray Brick, Round 1 x 1 Open Stud for$.02 or $.03 each. Sand Green 1x4 bricks appear in 16 sets including some fairly recent Ninjago ones. You need 41 element 3010 and they're going to cost you about $.34 each. I've been hearing so much talk lately about how much value the magical cheese slope adds to a set. This set must have a lot of value since it has 40 Light Bluish Gray Slope 30 1 x 1 x 2/3. Element 54200 appears in 260 sets and can be easily found for $.03 in volume. I wonder what kind of a grocery store stocks black skeleton legs. This set has 37 element 6266. It appears in 53 sets and costs about $.12 each. Next, we need 37 light bluish grey element 3070b. Tile 1 x 1 with Groove in this color appears in 160 sets. The average Bricklink price is $.09, but there are plenty available for less. Light bluish grey 1x6 tiles are next most prevalent. You need 36 element 6636 which appears in 234 sets. You can find all that you need for $.09. Element 3024 appears 36 times. Light bluish grey Plate 1 x 1 is in 226 sets. There are sellers that have the quantity that you need for $.02 each. Just in case you were missing the sand green bricks, we're back with element 3005. The 1x1 brick appears in 24 sets and I think it appeared fairly recently in the pick a brick walls. This caused the price to drop significantly to around $.07-$.08 each. You need 35 of them. You need 33 tan 1x2 plates. Element 3023 shows up in 331 sets. Several sellers have the quantity that you need for as low as $.01 each. Appearing in 403 sets, you need 32 element 3004. The light bluish grey 1x2 brick costs an average of $.07, but can also be found in volume for as low as $.03. Tan 1x1 plate element 3024 occurs in this set 29 times. This piece is in 126 sets. It averages $.08 but you can find all you need for about $.04. Much cheaper than the earlier sand green version, the light bluish grey 1x8 brick can be had for $.27. Element 3008 appears in 107 sets. You need 29 of them. 29 light bluish grey 2x2 corner plates follow. Element 2420 is going to cost you about $.07 each. It appears in 186 sets. 464 sets have the light bluish grey 1x4 plate. You need 28 element 3710 for this set. They average $.08 each. The next most numerous piece in the set is the white 1x2 tile with groove of which you need 28. I see a lot of these available in the $.04 range. 649 sets have element 3069b. I expected element 3009 to appear in more than 191 sets. You need 28 light bluish grey 1x6 bricks for this set. You can get what you need for $.12 each, while the average is $.16. Element 3070b is called for 26 times in this set. 246 sets have 1x1 black tile with groove. You'll be able to find them fairly easily for $.04. 26 light bluish grey 1x1 bricks are next. You should be able to get them all for $.03-$.04 each. 288 sets have element 3005. The last part to make the cut of most numerous is element 4216. The white 1x2 brick modified with groove shows up in 31 sets. It's only going to average about $.08. You need 25. We've already seen the largest proportion of the parts cost of this set. Sand green pieces are not common and this set has a lot of them. For the rare/expensive section, I run into only 11 pieces that fall within the criteria that I set. As I mentioned earlier, I am not going to repeat the parts listed earlier, so this is what else is noteworthy. Of the remaining parts, only 11 fall within the bounds of costing more than $1.50 and/or appearing in 10 or fewer sets. The most expensive piece that I found was element 4035. This part appears in 6 sets including 6990 Monorail Transport System. You need 4 White Window 1 x 2 x 3 Train that average $4.60 each. This next part is really fairly common. It is part of 76 sets. At $4.50 each the Green Baseplate 16 x 32 is not cheap, but won't break the bank like the earlier sand green pieces. You need 2 element 3857. The next piece, I like and you only need 1. Element 2039, White Lamp Post, 2 x 2 x 7 with 6 Base Flutes is almost a staple of the Modular theme. It appears in 21 sets and runs about $3.60, although some can probably had for cheaper. For about $2.40 each, you need 4 dark red Slope, Inverted 75 2 x 1 x 3. Element 2449 appears in 11 sets including 10196 Grand Carousel. Also requiring 4 is element 6005. The Brick, Arch 1 x 3 x 2 Curved Top in blue is part of 5 sets and averages $2 each. The Dark bluish grey Door Frame 1 x 4 x 6 Type 1 Element 30179 is posted as being a part of this set,but an alternate is give of element 60596. I honestly don't know which one is more proper, but the primary one costs almost 6x as much as the alternate. $2 vs.$.30. You need 5. The set is called the green grocer, so here's another sand green piece. 7 Hinge Brick 1 x 2 Base are going to cost you about $1.95 each. Element 3937 appears in 6 sets. Appearing in 4 sets, the reddish brown Tile 1 x 4 with Viking Snakes Pattern seems like an odd choice to me. Just because the other 3 sets it appears in are Hogwarts or Viking ships, it would seem out of place in a grocery store. You're going to spend about $1.75 each for the 3 element 2431pb043 that you need. No fears of crazy cat ladies in this set,you only need 1 white Cat Crouching with Black Eyes, Eyelashes, and Nose Pattern. Element 6251px1 appears in 14 sets and will cost you about $1.60. Just like the other door frame, the white Door Frame 1 x 4 x 6 Type 1 Element 30179 is posted as being a part of this set,but an alternate is give of element 60596. The difference in rarity is 10 sets vs. 76 and $1 vs. $.22. Whichever way you go, you need 2. The last piece on my list is element 3003. You need 3 Dark Green 2x2 bricks which can be found for $.05 each. It appears in only 8 sets. As a subset of the Rare/expensive parts, I'd like to take a look at the minifigures. Each of the minifigures is unique to this set. How unique are they? I mean, sure these figures only appear in this set, but are the parts that make them up also unique? 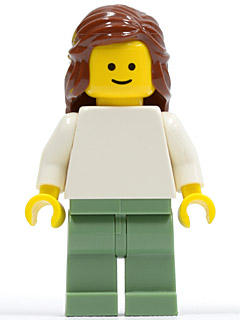 Our first minifigure is twn073 descriptively known as Plain White Torso with White Arms, Sand Green Legs, Reddish Brown Female Hair Mid-Length, but I'm going to call her Jane. She's plain Jane, no torso printing or unique head and the only part of her that is vaguely rare are her legs. Bricklink says that she sells in the $6 range which I think is crazy because her parts are half that cost. 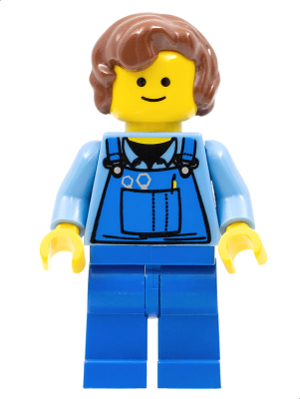 Next up is twn072 Overalls with Tools in Pocket Blue, Reddish Brown Hair Female Short Curled Ends. It seems like the only way you can tell these townies gender is by their hair. We're looking at a figure which sells in the $7-$8 range. What makes this minifigure expensive is the hair. It only appears in one other set 5378 Hogwart's Castle and is part of a $60 minifigure Professor Dolores Umbridge. The hairpiece sells for about $5-$6 by itself and the rest of the pieces wouldn't cost $1. I'm going to call this kid Boy Scout. 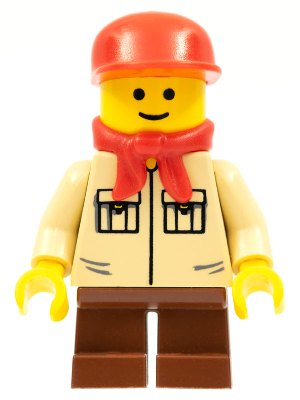 twn074 is described as Shirt with 2 Pockets No Collar, Reddish Brown Short Legs, Red Cap, Red Bandana (10185), hence why I call him Boy Scout, the other one is a mouthful. Coming in at $4-$5, this figure is not terribly expensive. The most expensive portion of this figure is the torso. Coming in at $2 it's not a very expensive piece and relatively common since it is shared by 8 minifigures, the only thing that bumps the price is that one of those minifigures is sw103 Luke Skywalker (Cloud City). (most of the other figures that share the torso part can be had for less than the cost of the torso.) Otherwise, his parts all tally for less than $1. The last guy, I'll call Jim. I have no good reason to, but he looks like a Jim to me. 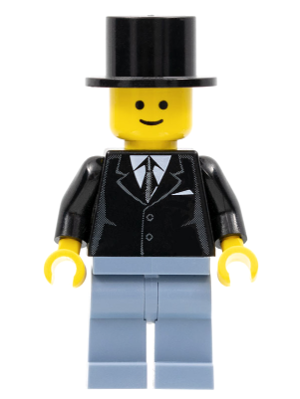 Jim has Suit Black, Top Hat, Sand Blue Legs (10185). The mayor of townie town twn071 sells in the $4 range. You're looking at maybe $2 in parts if you decide it's easier to buy his pieces separately. His Torso is the most expensive part, coming in at about $1. Jim's a good guy, just not terribly exciting. It's interesting to me that there's not a single unique piece in this entire set. Every piece can be found in at least one other set. There are no unique prints or even a sticker that would make the pieces stand out. If you feel like your set is not complete without instructions, you can find them, but they're going to cost you about $75-$100. Be sure that what you are buying is a complete set of all 3. If you feel that you need the box it's going to cost you another $100 or more. This article is by no means a complete inventory of the set. It is only meant as an a analysis of the parts of the set that will make it the most difficult and/or expensive to complete on your own. In some cases, it is useful to have an idea of which parts make up a set if you are purchasing a bulk lot or evaluating a used set. If you want to see a complete inventory check out Bricklink or Rebrickable.com. There are some people who make changes, substituting parts to make this set cheaper for themselves. We are not going to discuss those substitutions here, this article is only to understand what makes up a set as originally released by the LEGO Group. Check out this article written by @Ed Mack in 2012 and see if it has performed to his expectations. If you want to talk with others about the Green Grocer discuss it here. Great set - It really pushed the quality level of the Modulars forward (more detail, interiors, etc). I bricklinked one a few years ago. It would have cost the same to buy used. I think it would cost more than used to bricklink now. The windows were especially hard to get a decent price on. Great write up, especially linking to Ed's old article. Good advice from him back then. It's worth noting this set can be built in sand blue for considerably less and looks great. I'm just into the first few paragraphs. Fantastic write up. You've hit it out of the park. Also love the cheese wedge comments. The white lamp post is one of those examples where buying from Shop @ Home is the way to go. IF they are in stock, they are much cheaper than Bricklink prices. I was able to grab a few a year or so ago when I found one to be missing from a lot I was working on. Green Grocer used to be my #1 favorite modular before Parisian Restaurant came out. I am currently bricklinking the Green Grocer. I started it in June with only about 30% of the parts. I currently only need 66 parts left and have spent about $510. I felt like I couldn't leave them alone. I just have to be snarky every once in a while. Great article. I purchased a new set back in 2013 from a seller in Long Beach, CA. (drove about 1 hour to meet with the seller). He had quite a few of them. Paid $649 and I thought I was nuts for spending that much. 3 years later.... I am proven wrong. I finished Bricklinking mine ended up costing $619. Works fine for me, maybe refresh?